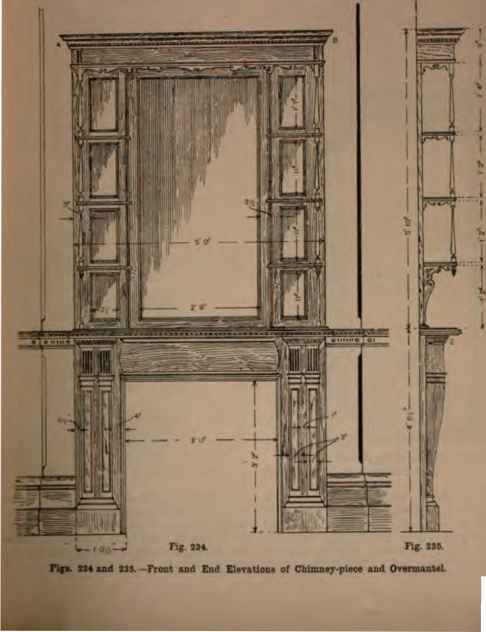 A hall chair in oak is shown in side and front elevation by Figs. 112 and 113, and in horizontal section on the line x x (Fig. 113) by Fig. 114. An enlarged detail of one front leg fitted to the arm of the chair is presented by Fig. 115. Details at a b c (Fig. 113) are shown on a larger scale by Figs. 116, 117, and 118. Figs. 112 to 114 are drawn to a scale of approximately 1J in. =±= 1 ft., and Figs. 115 to 118 to a scale of approximately 3 in. =1 ft. In working from Figs. 112 to 114, first construct an accurate scale, noting that the distance from the ground line to the top line in Fig. 112 measures exactly 47 in. ; from this all other dimensions can be obtained.